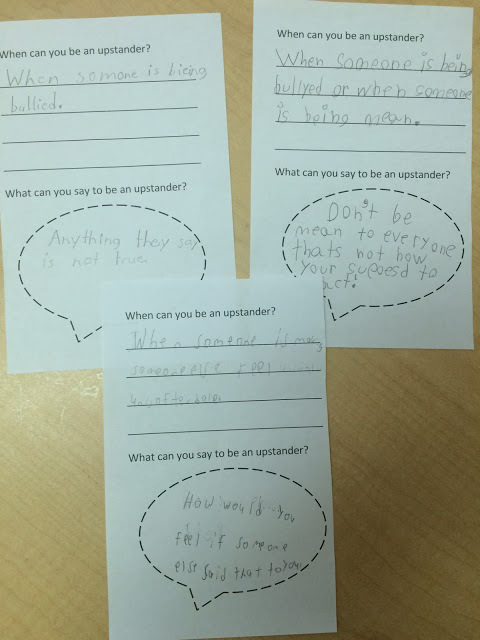 Continuing 3rd grade’s conflict resolution unit, we did a lesson on being an upstander. 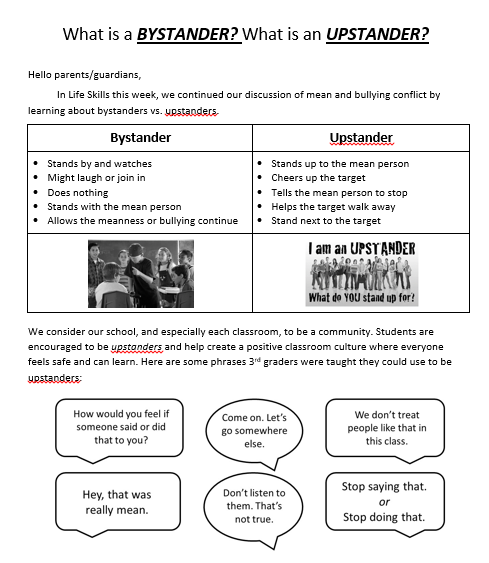 I tried to underscore, as much as possible, that being an upstander is not limited to bullying conflicts, that we should be upstanders whenever we see mean moments as well. This is the perfect follow-up to our Types of Conflict lesson, where many of my kiddos asked me “but what do we do if” questions. Push your nose like a button if someone has ever said something mean to you. Pull your ears if you’ve ever said something mean to someone else. Touch your elbows together if you’ve ever watched someone be mean to someone else and it made you feel uncomfortable. Pat your head if you’ve heard the words “bystander” and “upstander” before. Then we read the book Dare! : A Story about Standing Up to Bullying in Schools (The Weird! Series) by Erin Frankel. 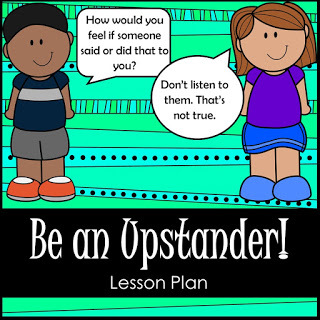 My favorite book for teaching the concept of skill of being an upstander is The Juice Box Bully: Empowering Kids to Stand Up for Others but that’s being included in the classroom mini-SEL libraries I’m creating (more on that later) and this book is pretty great as well. I didn’t personally love it when I first read it, but I’ve found my students really take to it. I usually offer to let the teachers borrow my companion Weird! : A Story About Dealing with Bullying in Schools (The Weird! Series) and Tough! : A Story about How to Stop Bullying in Schools (The Weird! Series) books if the kiddos are super into it. this story is going to be about? the one being picked on, but sad it was happening to someone else? isn’t the kind of person I want to be”? scared and alone after she’s mean to Luisa? 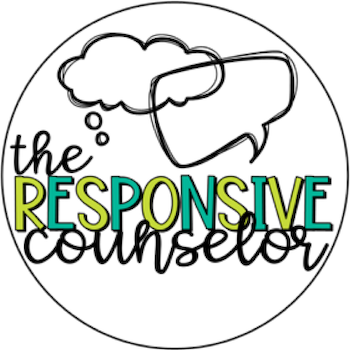 I want my students to know about the roles in bullying, but what I want even more is for them to learn and use the skills needed to have a positive school culture. I try to make my lessons skill building and not just “planting seeds of knowledge” when possible so that we can see real behavioral change with the students. In order to kick off the application portion of the lesson, I “pick on” a peer and say “What if I called Jasmine a mean name? 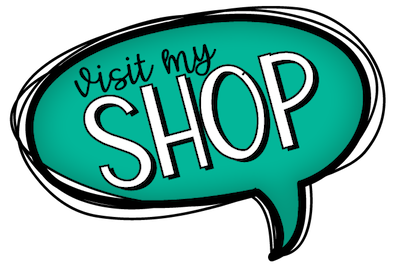 What kind of things would an upstander say to me?” and get some ideas. Then I ask “What kinds of things would an upstander say to Jasmine?” and get some more ideas. Then I introduce the activity of “Quiz, Quiz, Trade” to them – only a handful did this with their 2nd grade counselor or 2nd grade teachers. In this version, it’s less of a “quiz” and more of a “task”. 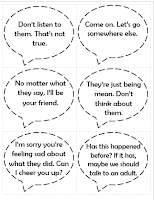 I have cards with different things an upstander would say (to the person being mean and to the person whose feelings are being hurt). 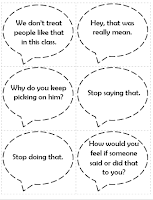 I teach and model how to do the activity (every person has a card, partner up, take turns reading cards, trade cards, find new partners, repeat) and then we discuss the tone of voice we should use. It’s hard to be calm and respectful when you’re angry someone has been mean to someone else! Depending on time, this is a 5-10 minute activity. When time is up, I get their attention and we return to our desks and they do an exit ticket for me. It’s a lot of paper (and trees), but I found this really worthwhile in 1) getting them to think through the skill and imagine a time to use it and 2) for me to get a sense of each class’ understanding and ability with this. In a world with endless time, I would have also included a round of beanbag freeze. This could be such a fun way to start a discussion about helping one another and how doing so makes things better for everyone. 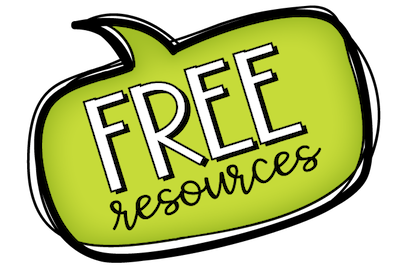 *Since finishing up this lesson with my students, I made some edits/updates/additions and put all of the materials on TPT here. 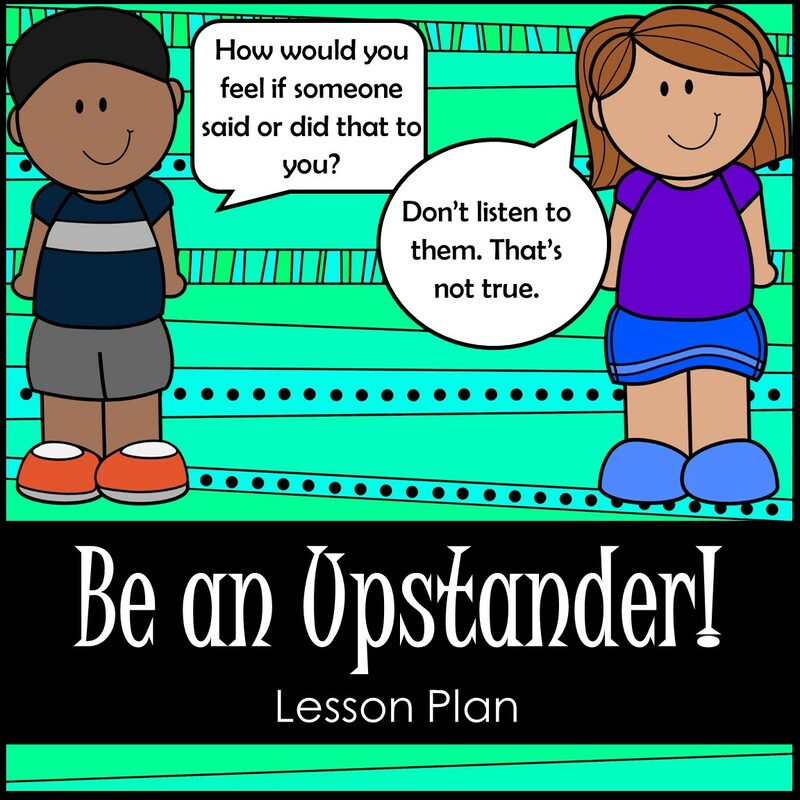 It includes the upstander statement cards and exit tickets shown above as well as upstander scenario cards and suggestions for a few different active ways to use them all with your class(es).